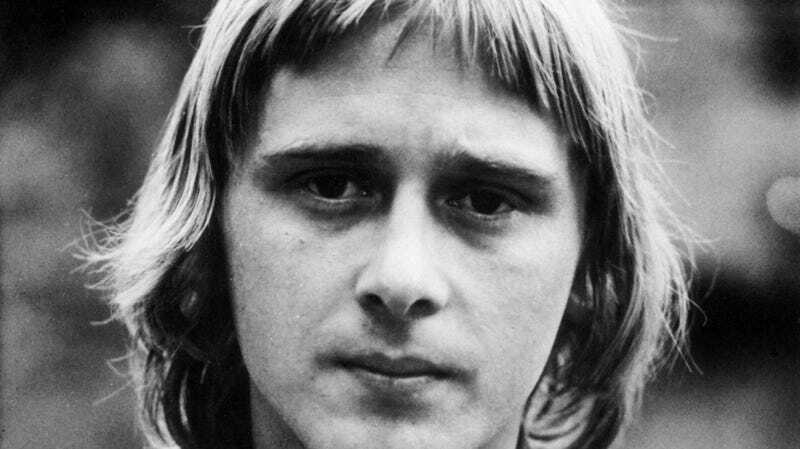 Danny Kirwan, whose songwriting talents and guitar skills helped transition the frequently fractious Fleetwood Mac from its earlier, blues-based roots to the rock-pop mega-outfit it eventually became, has died. Kirwan—who served as the band’s guitarist, singer, and occasional frontman from 1968 to 1972—was 68. Born in England, Kirwan caught the eye of Fleetwood Mac’s first lead guitarist, Peter Green, when he was only 17, impressing Green with his passion and skill. Taking a managerial interest, Green spent months trying to put together a band to support the talented youth, until drummer Mick Fleetwood eventually suggested he simply join Fleetwood Mac as a third guitarist (alongside Jeremy Spencer, who largely worked on his own material as the musical partnership between Green and Kirwan developed). Kirwan’s first major work with the band was on one of its biggest pre-Nicks/Buckingham hits, the instrumental blues riff “Albatross”; Kirwan’s willingness to play along with and support Green’s musical ideas is typically credited as a major factor in the song’s success. The unconventional three-guitarist set-up produced only a single studio album, 1969's Then Play On. Green left Fleetwood Mac the following year, citing mental health concerns, and leaving Kirwan and Spencer to push ahead with Kiln House, which shifted the band’s focus firmly in the direction of rock. Spencer left the band the year after—famously walking out to “get a magazine,” only to be found several days later as a member of religious group The Children Of The God—leaving Kirwan as one of the band’s primary creative voices. His leadership and songwriting—sad and soulful—were in strong evidence on Future Games and Bare Trees, which not only raised the group’s international profile, but signaled a shift toward the pop sensibilities of its megastar era. But Kirwan wouldn’t be around to sample the group’s Rumors-based success; perfectionism, alcoholism, and an apparent dislike for the spotlight of public touring slowly but surely drove a wedge between himself and the band’s other members, culminating in an infamous incident in which he smashed his own guitar before a show, then forced the rest of the band to go on stage without him. It was the final straw for Mick Fleetwood, who fired Kirwan from Fleetwood Mac. And that, somewhat bafflingly, was the end of Danny Kirwan’s contributions to the musical world. (A recent Observer tribute to his influences on Fleetwood Mac referred to him as the band’s “Sad, musical ghost.”) His life in the intervening years was poorly documented but apparently hard; there are multiple mentions of homelessness or living in a hostel, and very few signs of joy. He was inducted into the Rock And Roll Hall Of Fame in 1998, but didn’t attend the ceremony; his solo albums were released on CD in Japan in the mid-2000s, but it’s not clear if he ever received a dime. Despite shepherding one of the biggest (and most troubled) bands of his lifetime through one of the rockiest transitions in its history, he appears to have simply disappeared from the musical life from 1980 on.